The Place Des Nations Unies is a large open city square in the heart of the Calablanca city and is surrounded by an array of shops and restaurants. Lined with beautiful palm trees, the Place Des Nations Unies is such a space where the confluence of the Old Town and the new town is evident. It is one of the largest squares having convenient access to the light rail stations, luxury accommodations, shops, offices, banks, food joints, a traditional souk and a movie theatre. The square was built in the year 1970 with the name of Kora Ardia meaning the Planet Earth Square. Beneath the metal globe-like structure and the clock tower, you can sit back and enjoy the city life moving fast. How popular is Place Des Nations Unies? People normally club together Marche Central and Old Medina Of Casablanca while planning their visit to Place Des Nations Unies. 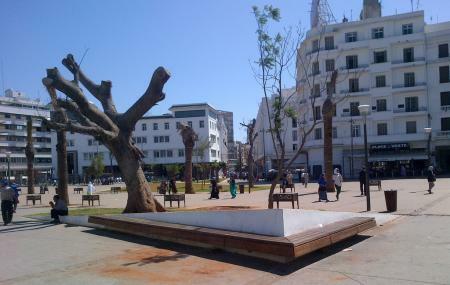 Casablanca is having unwind area in Place des National Unies Tram tracks run through this area. Shopping , restaurants, eating joints on both sides. If you want to shop then right from clothes to jewellery everything is available. Due to proximity to sea this place has amazing breeze. Restaurants with outside sitting is ideal place to sip Moroccon Tea. It's something to see in Casablanca, but not much to do.